So it’s been a pretty unorthodox first week, but still to the level of excitement and to some extent excitement that I had on the first day. Like I mentioned in the last post, though, this week was not ordinary in that everyone was preparing for this amazing thing called Sports Day. I think it’d be safe to call this a national phenomenon, because I’ve never heard of an American track & field day going to such great lengths. I mean sure, we had the three legged races, the tug of war, but never to the extremes that these kids basically missed two days of actual classwork in order to participate in these activities. On top of that, you have to keep in mind they’ve probably created some of their team ideas (like the posters and group dances) over their summer vacation because they’ve only been in school for a week. I really wish I could show you some of the pictures of the games they played, but hopefully I’ll do half as good in describing them. Of course, we started out on the field promptly at 8:00 in the morning. Remember this is a Saturday, and as the most important school day of the year, I’d already been awake for a good two hours. (Thankfully, I also had the time to make a great-fried-egg-hash-brown-jam-and-bread-yogurt-V8-breakfast.) Despite some questionable weather in the middle of the week from one of the recent typhoons, the day was clear sunshine and windy enough for that not to be a nagging annoyance. I quickly found the green team tent, on the edge by some shady trees, and watched as the group organized and made it through the opening ceremony. Somewhere here I think I started to understand the awful reality of someone who takes up this job without speaking a lick of Japanese. I definitely felt it myself by the end with my limited vocabulary used up, but to be stuck out there the whole day trying to communicate purely in gestures in broken English would probably change my perspective on Sports Day. As it is, I thankfully retained enough Japanese to get by and was able to fulfill the boredom between games by learning about the day from another teacher or making jokes with the students. Back to the point: imagine every fun camp game that you think would be fun to play at school, but would never be able to because it’s just a lawsuit waiting to happen, and that’s Sports Day. 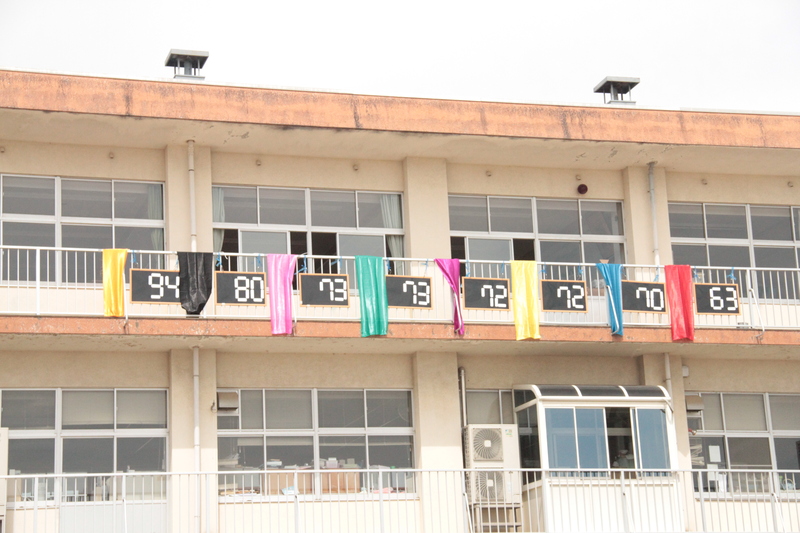 Each group had a section of each year represented, for the first and third years (read: seventh and ninth grade) it meant their entire class of thirty people, while second years got mixed with other seconds years from different classes. That way the games could not only be split between the eight teams, but sometimes involve just a certain grade or classes. For the beginning we started off pretty tame, with a giant jump rope and crew of about 20 students trying to jump over it at the same time. Against my expectations and maybe misconceptions that all Japanese people are great at working with each other and would be super efficient at this game it actually proved to be quite the feat to get down. But once a group did get the right rhythm, boy could they go. One of the groups got over twenty times around before tripping up. Imagine it for a second: ten boys, ten girls, side by side in their purple and white gym uniforms, jumping in perfect sync for half a minute. To some extent downright mesmerizing. From there the games only got more creative. The next was a sort of race, in fact, I think it could be classified as a relay, because even though there was only one runner about 15 people participated. It starts with four of them, crouching down to form a sort of stairway with their backs, while the runner–typically the smallest–runs up to the top step/back and the rest of the people start forming a pathway with their own backs. When the runner steps off whatever back their on, the person crouching over shuffles to the front of the line to continue the path. The person running, again a tiny and weightless first year, wears a helmet and has someone holding their hand to help, but still, their a good four feet off the ground, and certainly a couple fell more than once. They way they moved, though, really looked like a single person running over a fluorescent blur of centipede like human legs, and they made it fifty yards, around a cone, and back in under a minute. 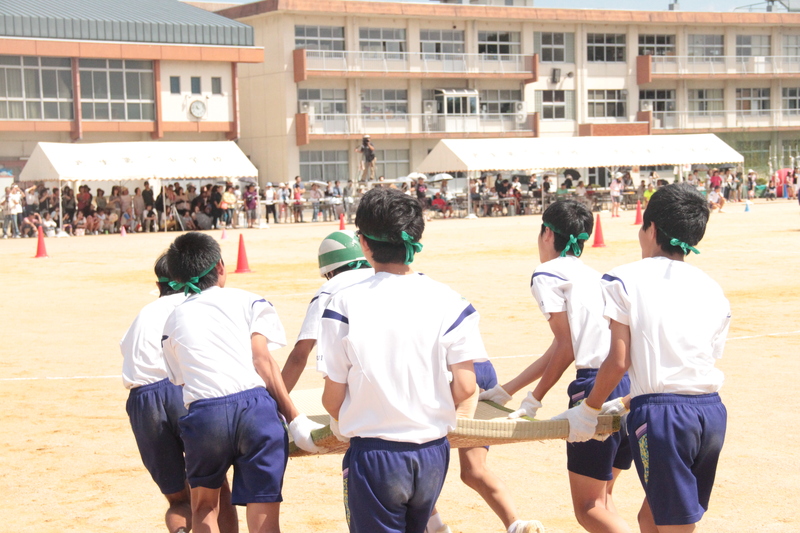 Next up came a short bout of tug-o-war, a stranger version than what I think I’m used to, in which strategy (or what little there would be in tug-o-war) was completely given over to brute strength (or what little raw power there would be in an average Japanese junior high student). Fun, painful to watch, but all around less exciting. I think they were just having a break to ramp up to the next activity: マジク・カーペト (the magic carpet). This was perhaps my favorite of the day. They laid out tatami mats and went in rounds of seven people (gender specific, like all the games), where one person would lay out on the tatami, while the other six would gather around and lift the mat. They then would carry them down around a gone and back as quickly as possible, and almost certainly dropping them one or more times. I saw some crazy stunts, The people bringing back the tatami would drop the tatami while the next person would jump in the air and slide onto it. Other riders would be brave enough to stand up and ride it like a surfboard. All the time, I don’t think anyone had reason to not be smiling. We had a short intermission for lunch and recovery before it was back on the field for the classic fun game which they were calling “Candy Crush.” Now, I’ve never played the digital game, but I wonder where the name comes for this version, because the candy part, if there was one, was minimal at best. It starts off with your classic person spinning around a baseball bat for however many times or seconds, and continues with the person being tied at the ankles with a partner and completing the well known three legged race. Where it deviates, however, is halfway down the stretch where the pair, along with another couple, has to dunk their head in a tray full of flour and search around with their mouths until they can procure the elusive “candy” piece, and then race to the finish with mouth, hair, and vision caked over to ghostly perfection. Quite inventive, if not a bit disgusting. The next was perhaps the biggest moment of the day when each team got to perform their own original dance. If you don’t remember, this was a Saturday, and before you might’ve asked yourself why they would make everyone come in on a Saturday instead of just doing all of this over a Thursday/Friday sprint. Well, I briefly thought about it, but by one o’clock on this bright day I quickly understood through looking over at the packed tent set up on the side of the field designated specially for parents. Actually, more impressively was the mention by another teacher that plenty of elementary school teachers and vice-principals would also show up to cheer their former students on. I mean, what more could you want to say F-yeah to? After the dances came the pinnacle game in creativity: bakudan, which basically translates to bomb. Think foursquare and volleyball, and then instead of a ball think of the type of ball an Elephant might balance on at the circus. Granted, the balls we were using were filled with air, but still, size-wise I can only imagine four student probably fitting into one of the balls. The teams had to volley the balls into another teams area, over a net, without letting it fall onto their side. If it did, they were out, and the nets would move around to three, and then two courts. My team was pretty successful, making it to the second place for both boys and girls., but then again, one strategy that seemed to work was just try to avoid getting the other team to pass you the ball in the first time. They followed up with a class relay, a spin on tug-o-war where they raced to the ropes, and ending in a twenty-legged race of each class which would either end triumphantly or in disaster. All in all, the day seemed like it could go on forever–but in a not so bad way–and by the time four o’clock came round and we were lining up for closing ceremony I was sort of hoping it would. Following the ritual of lining up, accepting awards, and superfluous bowing the groups met back under their tents for closing remarks. The green team ended up getting the second place, not that the point count for anything, but you know, bragging rights and all. 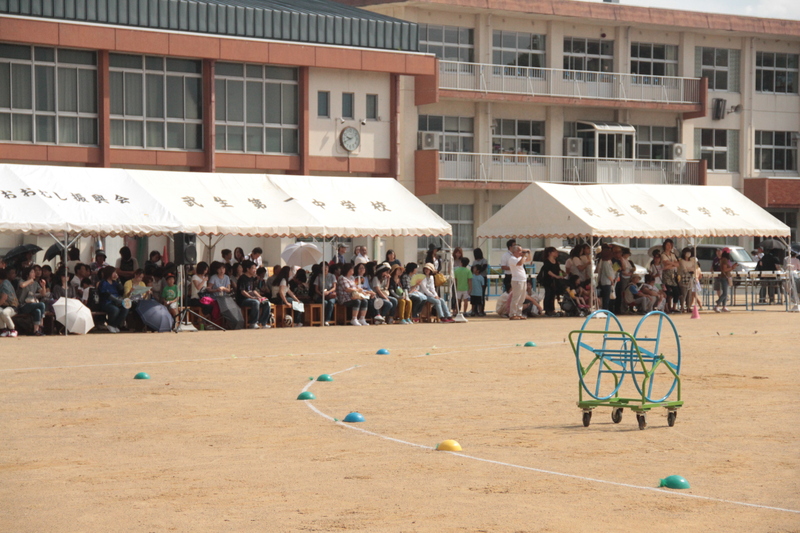 For the third years, this would be their last time doing Sports Day with the junior high, and to some extent with the extreme childlike fun that divides Junior high from the later teenage years. Early on in the day I think I made a joke about how it’d be a time when all the girls would break down and cry and one of the other teachers, without catching my sarcasm, nodded in agreement at the sentimentality of it all. I wasn’t sure if I’d be stuck in begrudging the situation until our team leader, a boy with a knack for cheering and competition, got up and made his speech. Flanked by the other third year leaders, he made it only a bit into his speech before pausing. At first I didn’t catch on to what he was trying to do. It looked like he had to cough, or maybe was at a loss for words. In someways I guess both were true, but as soon as the others started cheering for him, “gambate,” it was pretty clear he was starting to tear up. This is when everyone else started breaking down, and I must say I was pretty moved by the scene. After all, I was part of the group, cheering at times with the loudest voice, and the exhaustion and effort of the whole day probably wore on everyone. At the end, they ended up encircling him and tossing him into the air a few times. 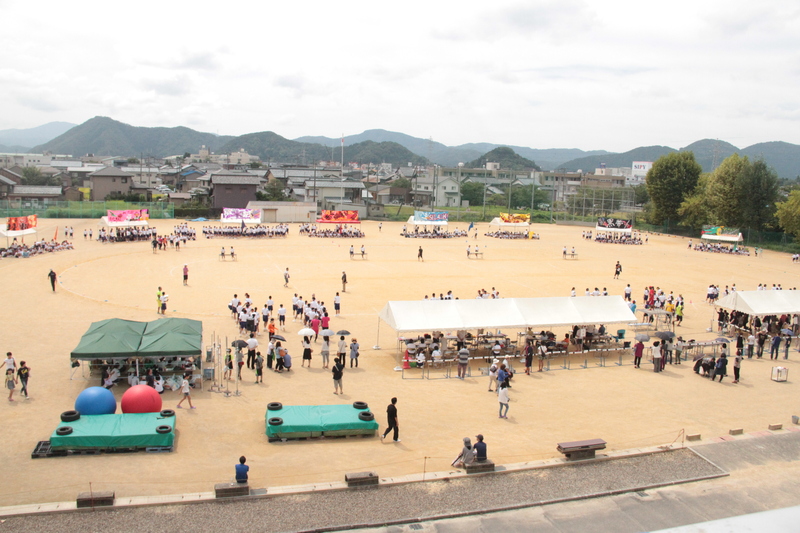 By now it should be no wonder why it is such a big deal among Japanese schools to have a positive Sports Day. I don’t think I ever allowed myself to have a truly loathsome attitude at coming to school on a Saturday (especially since we get Monday off), but at the end of the day it was really no question of how else I’d want to spend my weekend. When I got home I went for a run through the mountains behind my apartment (the so called “backyard”), and felt more energy coming back than I had leaving. Not to mention that we had an enkai later on in the evening, where I finally started to branch out and get to know (or at least talk to some of the other teachers at the school). I’m really starting to wonder if this is what they call the honeymoon period. Posted in JET, School.Tagged school event, students, work.